Scooper - Technology News: How much economic growth comes from our cities? How much economic growth comes from our cities? Cities are mankind’s most enduring and stable mode of social organization, outlasting all empires and nations over which they have presided. Today cities have become the world’s dominant demographic and economic clusters. As Christopher Chase-Dunn has pointed out, it is not population or territorial size that drives world-city status, but economic weight, proximity to zones of growth, political stability, and attractiveness for foreign capital. In other words, connectivity matters more than size. Cities thus deserve more nuanced treatment on our maps than simply as homogeneous black dots. This map from Connectography shows the distribution of the entire world’s population, with yellow representing the most dense areas. These zones are, not surprisingly, where you find the dashed ovals that represent the world’s burgeoning megacities, each of which represents a large percentage of national GDP (indicated by the larger circles) in addition to its role as a global hub. Within many emerging markets such as Brazil, Turkey, Russia and Indonesia, the leading commercial hub or financial centre accounts for at least one-third or more of national GDP. In the UK, London accounts for almost half Britain’s GDP. And in America, the Boston-NY-Washington corridor and greater Los Angeles together combine for about one-third of America’s GDP. 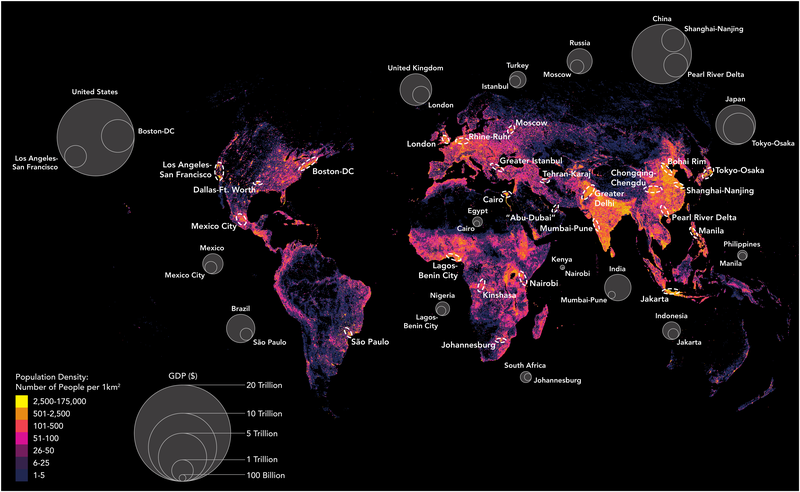 By 2025, there will be at least 40 such megacities. The population of the greater Mexico City region is larger than that of Australia, as is that of Chongqing, a collection of connected urban enclaves spanning an area the size of Austria. Cities that were once hundreds of kilometres apart have now effectively fused into massive urban archipelagos, the largest of which is Japan’s Taiheiyo Belt that encompasses two-thirds of Japan’s population in the Tokyo-Nagoya-Osaka megalopolis. China’s Pearl River delta, Greater São Paulo, and Mumbai-Pune are also becoming more integrated through infrastructure. At least a dozen such mega-city corridors have emerged already. China is in the process of reorganizing itself around two dozen giant megacity clusters of up to 100 million citizens each. And yet by 2030, the second-largest city in the world behind Tokyo is expected not to be in China, but Manila in the Philippines. America’s rising multi-city clusters are as significant as any of these, even if their populations are smaller. Three in particular stand out. First, the East Coast corridor from Boston through New York to Washington, D.C., contains America’s academic brain, financial centre, and political capital (the only thing missing is a high-speed railway to serve as the regional spine). From San Francisco to San Jose, Silicon Valley has become one continuous low-rise stretch between I-280 and US-101 that is home to over 6,000 technology companies that generate more than $200 billion in GDP (with a San Francisco–Los Angeles–San Diego high-speed rail, California’s Pacific Coast would truly become the western counterpart to the northeastern corridor. Elon Musk’s Tesla has proposed an ultra-high-speed “Hyperloop” tunnel system for this route). Finally, the Dallas–Fort Worth Metroplex, the largest urban cluster in the American South, houses industry giants such as Exxon, AT&T, and American Airlines in an economy larger than South Africa’s and is actually building a high-speed rail (well, 120 kilometres per hour) called the Trans-Texas Corridor that could eventually extend to the oil capital Houston based on plans rolled out in 2014 by Texas Central Railway and the bullet-train operator Central Japan Railway. Great and connected cities, Saskia Sassen argues, belong as much to global networks as to the country of their political geography. Today the world’s top 20 richest cities have forged a super-circuit driven by capital, talent, and services: they are home to more than 75% of the largest companies, which in turn invest in expanding across those cities and adding more to expand the intercity network. Indeed, global cities have forged a league of their own, in many ways as denationalized as Formula One racing teams, drawing talent from around the world and amassing capital to spend on themselves while they compete on the same circuit. The rise of emerging market megacities as magnets for regional wealth and talent has been the most significant contributor to shifting the world’s focal point of economic activity. McKinsey Global Institute research suggests that from now until 2025, one-third of world growth will come from the key Western capitals and emerging market megacities, one-third from the heavily populous middle-weight cities of emerging markets, and one-third from small cities and rural areas in developing countries. There are far more functional cities in the world today than there are viable states. Indeed, cities are often the islands of governance and order in far weaker states where they extract whatever rents they can from the surrounding country while also being indifferent to it. This is how Lagos views Nigeria, Karachi views Pakistan, and Mumbai views India: the less interference from the capital, the better. It is, of course, very difficult if not impossible to neatly disentangle the interdependencies between city and state, whether territorially, demographically, economically, ecologically, or socially. That is not the point. Across the world, city leaders and their key businesses set up Special Economic Zones and directly recruit investors into their orbit to ensure that their workers are hired and benefits accrue locally rather than nationally. This is all the sovereignty they want. To that end, entire new districts (sometimes called aerotropolises) have sprung up around airports to evade urban congestion and more efficiently connect to global markets and supply chains. From Chicago’s O’Hare and Washington-Dulles to Seoul’s Incheon Airport, such sites have become the fastest-growing economic geographies, underscoring the intrinsic value of connectivity. For companies moving their headquarters into an aerotropolis, the airport is the gateway to world markets while the nearby city, no matter how large, is just another sales destination. Recreating the world map according to the three dozen mega-cities therefore tells us much more about where the world’s people are and money is than conventional maps of 200 separate countries. This article is part of our Beyond GDP series. You can read more here . The map and commentary are adapted from the author's book, Connectography: Mapping the Future of Global Civilization .